Because one two wearables weren't enough, Samsung had to go and announce a third. This one is a little bit different from the Gear 2 and Gear 2 Neo, however – it's called the Gear Fit, and it's basically a fitness tracker with a twist... or rather a curve. The Fit isn't your typical run-of-the-mill fitness tracker, according to Samsung. It's packed with "the most comprehensive fitness tools available," and it also sends notifications from Galaxy smartphones, alerting users of incoming calls, emails, texts, alarms, and the like. So, it's kind of like a Gear, but not really. Only sort of. But still different. On the hardware side, the Gear Fit sports a 1.84 inch 432x128 curved Super AMOLED display, Bluetooth 4.0, an interchangeable strap, IP67 dust and water resistance, accelerometer, gyroscope, heart monitor, and 210mAh battery. Samsung claims it'll go for 3-4 days between charges, which is decent. Unfortunately, there's no word on cost, but the Gear Fit should be available starting in April. Update: The Fit (along with the S5 and Gears) will be available on April 11th in 150 countries. 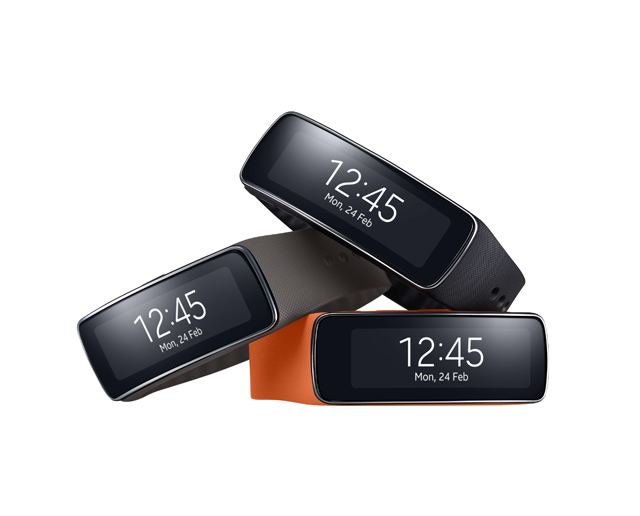 Barcelona, Spain - February 24, 2014 – Samsung Electronics Co., Ltd. today introduced the Samsung Gear Fit, the industry’s first curved, Super AMOLED wearable device for the active consumer. The Gear Fit offers the unmatched convenience of Samsung Gear technology with the most comprehensive fitness tools available, empowering consumers stay physically active without sacrificing personal style or mobile connectivity. The Gear Fit will be available globally starting from April. Full details and product images are available atwww.samsungmobilepress.com or m.samsungmobilepress.com.